C & E went camping with Dad last weekend. 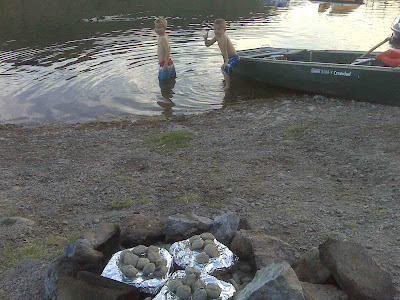 They cooked tinfoil or hobo dinners and attempted to fish in the lake. The next weekend we were lucky enough to have my in-laws take us to the lake for some boating fun. Anyone who knows him, knows he loves any sport that involves a board. And, since we no longer live near the ocean, this is a great toy for him cause you can use it on the lake. Can you tell we're trying to enjoy the beautiful spring weather before the dreaded summer heat hits! Excuse the pics. They were taken with my husband's cell phone.